Upper ankle joint (TC joint) is a demanding joint for imaging. Cartilage is in many ways different from that in knee joint. It is more dense, and it's thickness is merely 1 mm with very sharp curved edges on talus shoulder areas. This combined to overall dimensions of smaller joint requires high spatial resolution. Spatial resolution of CBCT imaging is high enough to clearly show cartilage and bone lesions in ankle area. 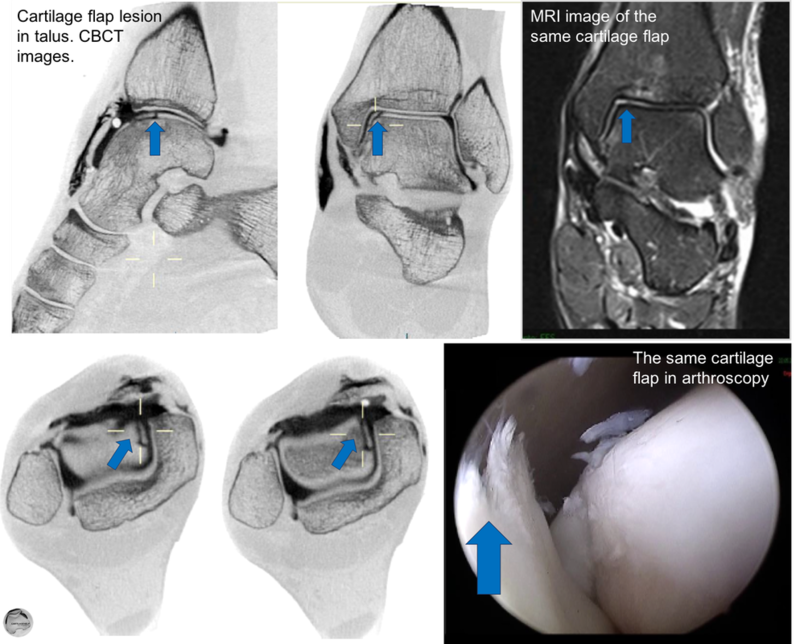 Following example show CBCT images, MRI image and arthroscopy findings of the same cartilage flap in talus. Spatial resolution of CBCT imaging is enough to see also cartilage layer thinner than 1mm, for example in 1MTP joint. This joint area is not routinely imaged with contrast media, but in some high demanding professional athletes it is sometimes crucial to know joint condition, plantar plate and sesamoid bone condition exactly. Imaging can be done in true weight bearing conditions. Below are two CBCT images of 44 years old professional ballet female dancer with painful locking symptom in MTP I joint with a cartilage defect. On the left in rest, and on the right with weight bearing.